^ Status - Passed review, both now available for public install/update. Latest update for these two is now done and being soak tested for 24 hours before uploading to AMO. Only a couple of fixes/improvements this time as these are now very near their final look. If you want anything added to them then now is the time to ask, as they'll be no more updates on these for a good few months. Humour me, let's at least pretend that people are interested in SeaMonkey themes. #1. Urlbar 'Go' button improved. #2. Code support for the SeaFox extension's Combined Back/Forward feature. Sweet, they look great Frank! Frank Lion wrote: Humour me, let's at least pretend that people are interested in SeaMonkey themes. Well I am and amazed how few downloads there are.. presumably due to AMO's Where's Waldo hide the themes policy. - Thunderbird 34 - 40. Minor improvements and bug fixes. Major change is that this theme now also styles the Thunderbird Email program. I've done lots of little improvements on these, things like a better notification alert, more consistency than default on the close button side, tuned the dropmarkers, etc. etc., small but good improvements. I've also added support for the 'Old Addons Manager' extension, which should really be in the default SM. 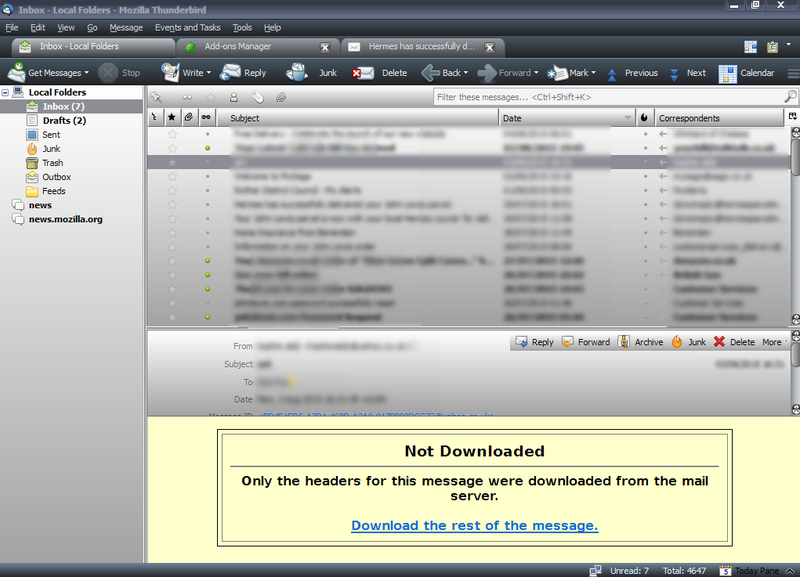 Of course, the biggest change with these themes are that they both now theme the Thunderbird Email client. That came about as I'll soon be doing a non-public theme that I wanted to use on both SM and T/Bird. So, the first stage for that was to get my theme engine templates up to speed to make that possible. That all went easier than I imagined and the result is these. Both themes were beta-tested by a very experienced and long-standing T/Bird user of many years (you do actually all know him around here) and not found wanting. So....I would appear to be a Thunderbird theme author as well. #1. Slight button twitch (Linux) fix. #2. More minor dialog windows styled. #3. Complete new restyle of toolbarseparators. #4. Fixes for Quick Folders extension. #5. Complete new restyle of Find Bar. #6. Minor restyle of checkbox and radio buttons on hover. #2. Thunderbird reply to message text colour fixes. #4. Text colour coding fix. #6. Various minor buttons now have hover effects fix. #7. 'Under the hood' toolbarbutton coding fix. #1. Thunderbird (Linux) menubar text fix. #4. New toolbar button coding for extensions added. #7. SeaMonkey Email splitters and grippies restyled. #10. More minor windows styled. #11. Calender menulist bug in Thunderbird Customise Window fixed. #12. SeaMonkey sidebar styled when loading content. A nice, trouble-free, round of update changes to these. I know it looks like I've done a lot, but in reality apart from me fixing a bug in Thunderbird in #11, all the rest are just subtle, but important, styling or restyling improvements. These themes are just not breaking at all in the old fashioned 'Here comes an update, whoops my theme is now totally wrecked' type way and are actually a pleasure to work on (in the same way that chess is a pleasure to play). Yep, you need to concentrate, but most of this stuff is just quietly done in the evening as I listen to radio plays or Gregorian chants. Very relaxing, bit like this place, where you can just write what you like knowing that no one actually reads it. Last edited by Frank Lion on September 25th, 2015, 3:25 am, edited 1 time in total. Frank Lion wrote: Very relaxing, bit like this place, where you can just write what you like knowing that no one actually reads it. Not a word of it. Hmm....yes I've noticed that with the Fx Tigers too, they seem to be pretty much oblivious to rabid releases. Whatever you're doing works, the tab audio indicator appears and the theme handles muting fine, FWIW 42b 'broke' Ex Noia, they don't show. Wonders: I reckon with some of the remaining top 10 weighing in at between 2.5 and 4mb ! they must be far more susceptible to change and a damn sight more complicated to fix.?? Always the optimist (believe it or not) I did think that your original 'template' would spawn a theme revival.. oh well. Thanks mate, all SM and Fx themes look boffo gorilla..
mightyglydd wrote: Hmm....yes I've noticed that with the Fx Tigers too, they seem to be pretty much oblivious to rabid releases. Yep, I was sent screenshots today of the Tigers on Win10 and they are working fine. (that's on 43, when some other guys can't even put out a FF41 version on anything at all) Titlebars are fine and so is everything else. Pretty bizarre when you consider that I've never even seen Win 10, let alone done any special coding for it. I'm sure that one day the Firefox ones of mine will break badly in a 'that just can't be fixed' type way but I'm equally sure that when XUL ends in Firefox then so will themes for it. Of course, it doesn't help that I no longer use Firefox on a day to day basis, so I am going to miss things sometime. But...we'll just have to see how we go. mightyglydd wrote: Wonders: I reckon with some of the remaining top 10 weighing in at between 2.5 and 4mb ! they must be far more susceptible to change and a damn sight more complicated to fix.?? Always the optimist (believe it or not) I did think that your original 'template' would spawn a theme revival.. oh well. Yeah, DV of Noia was saying the other day that he was spending 30 - 40 hours a month fixing just his 1 theme and has now quit (or 'hanging it up' as Pat calls it). As I think I predicted way back, I doubt if I'm spending even 3 or 4 hours a month fixing all mine. This last update on these would have taken around that, I reckon. But, the thing is that 95% of that time was spent actually theming - styling or restyling parts to look/work better. Stuff that didn't have to be done, but was done just because I can and wanted to. In other words, doing the job we're not paid for, as opposed to fixing stuff that an update had broken. Anyway, I'm pleased you like them.